Biriyani in itself doesn't require any other accompaniment because of the tremendous flavors & spices in it,but at times a flavorful raitha or chutney serves best.But long before,When we were at Hyderabad,I remember the restaurants serving a spicy tomato gravy along with biriyani there.And finally when I saw this recipe here,I prepared the same.The dish can't be called a true copy of the restaurant version but almost the same.This is good delicious spicy gravy made with coconut paste and a touch of coconut milk too.We devoured it with our favorite Chicken Biryani.Check this out!! -Dry roast the coconut,khus khus,cashew nuts for 3 minutes and then grind to a smooth paste. -Heat oil in a pan.Add the whole spices for a minute and then add onion.Saute onion till translucent and lightly browned. -Add the ginger garlic& chili paste,saute till rawsmell disppears.Add the curry leaves and dry spice powders except garam masala.Toss it well. -Add the tomatoes and cook till mashed.Add the ground paste and cook for 5 mins until the spices have combined. -Add 2 cups of water,adjust salt and bring to boil.Cover and cook till the gravy thickens and tomatoes are mashed. 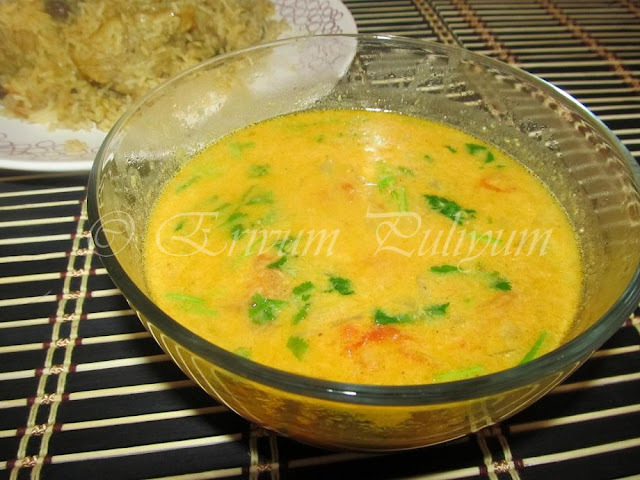 -Add the thick coconut milk on low flame and add garm masala.Garnish with coriander leaves. -Remove from heat and serve with biriyani. * I have added only 1/2 tsp of chilly powder as the biriyani itself was very spicy.You can add upto 1tsp of chilly powder as per the original recipe. * You can serve this with mango rice, paneer -mushrom pulao, vegetable biriyani,Fish biriyani, Minty Jeera rice or even rotis too. Delicious curry I will try to make this weekend. Looks inviting, very delicious and healthy curry. Yummy gravy! Looks creamy and delicious! wow...curry sounds very delicious, i am so much tempted on seeing the biryani(chicken rt?!) booth looks too tempting dear!! Looks superb. Will try for sure sometime. Love this curry...never tried this esp with Biriyani..
Wow...tomato curry looks creamy and yummy. Yummy...Have tasted this before but never tried...very easy n delicious one..
Tomato salan as they call it! Lovely accompaniment. How flavourful this side dish na. Woww!! Sounds great.. Looks yummy.. I'll try this for jeera rice.. bookmarked !! Love anything with tomatoes..this is no exception..very healthy. Serve me this anytime. I will eat two big bowls! adipoli curry..this biriyani side dish is new to me..looks yummy ! yummy and nice side dish.. This is a very different side dish for biriyani..looks nice.will try it.